Protecting the public from harmful products and services is an important role of the American government. But regulators struggle to achieve this goal as they encounter relentless push-back from industry lobbyists trying to weaken or kill rules. Most media coverage of public protections focuses on Industry complaints about the cost of new standards (without any acknowledgment of the benefits) or devastating stories of consumer deaths resulting from a lack of regulation. Without a positive narrative, we forget about the incredible quality of life that effective safeguards afford the American public. 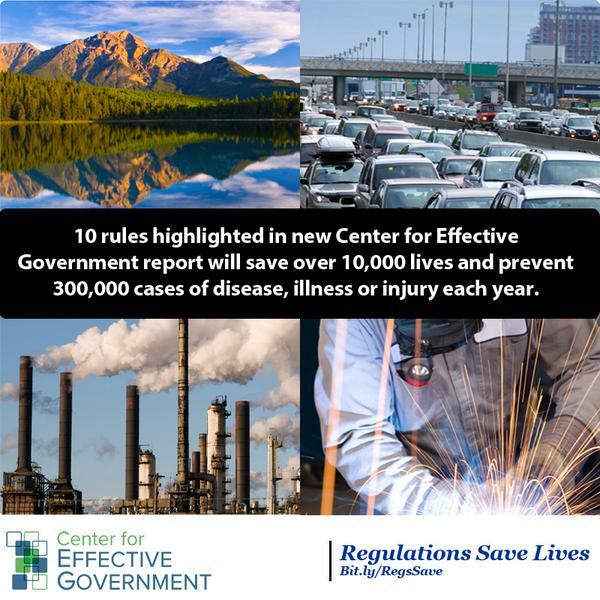 To draw attention back to the health, environmental and worker safety benefits we reap from government safeguards, the Center for Effective Government has released a report on 10 rules that will save over 10,000 lives and prevent 300,000 cases of disease, illness or injury each year. Using the traditional, regulatory methodology of benefit-cost analysis, the report shows that these 10 rules have monetary social benefits that far exceed their estimated compliance costs. In addition, three of the rules are likely to create new jobs. This just goes to show that the sky-is-falling, anti-regulatory rhetoric of industry and its allies in Congress is false. Standards and safeguards can spur innovation and even create entire new industries. Lost consumer confidence and shaky financial markets are the real job killers. We need standards and safeguards so that families who work hard and play by the rules can build a better future for themselves and their children.